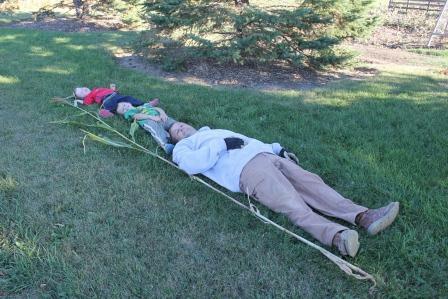 Sam and Keith take a break after working hard harvesting the broom corn. 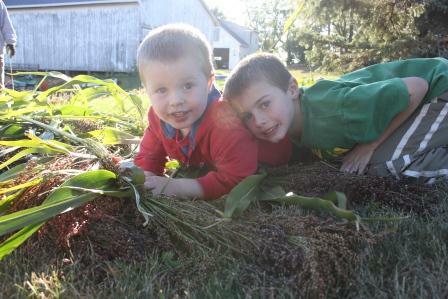 They also were great help harvesting popcorn and cutting down corn stalks to clean up the garden this weekend. I have always enjoyed the fall harvest season. To me, the season reminds me of hard work, satisfaction of a job well done and excitement to see how your efforts have been rewarded. This weekend was all of that. 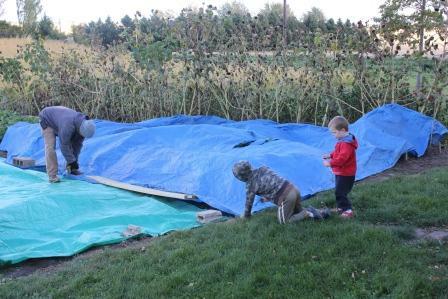 All four of us worked hard harvesting tomatoes, peppers and cucumbers on Saturday before the frost. On Sunday, we headed back out and spent the afternoon cleaning out all of the vines and corn varieties. Can you believe that this week is our last week. All ready week 18! I find it quite interesting that both boys have on different occasions and more than once indicated an interest to continue to do this and explained what they liked most about the CSA. 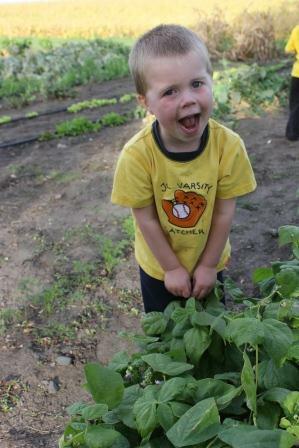 As you can see, hard work reaped a lot of tomatoes that are being distributed at St. Peter’s Lutheran Church, Sibley Elementary, Northfield Montessori and the local food shelf. 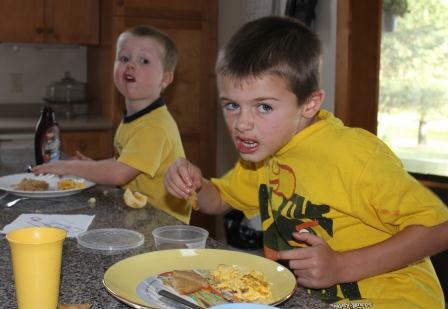 As you can see the boys were both exhausted and a bit goofy from their efforts. 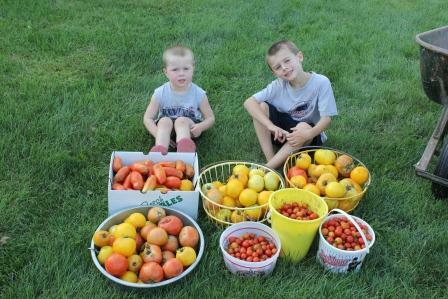 Thankfully, the frost did not kill the tomato plants, so we still have plenty to harvest. If you are interested, free will donations are excepted with part of the proceeds going to Gillette Children’s Hospital and the American Red Cross. Saturday night, we did get a frost. So to protect the plants from the cold, we covered the lettuces, spinach, green beans, Dragon Tongue beans and peas on Saturday afternoon. The late plantings are an experiment to see how late we can plant, and how well these varieties perform during this time of the year. If they produce, we will offer the shareholders a bonus box. You will be notified to see if you are interested. 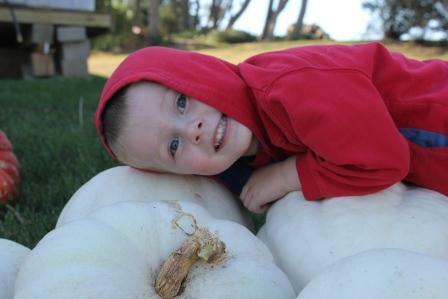 Sam loved the white pumpkins – both the color and their smooth skin. 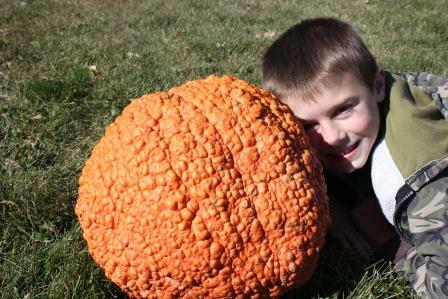 Keith’s favorite was this warty pumpkin. Odd how only one grew. But still quite an interesting pumpkin! Note: If you are interested in being included in next year’s CSA. Please let us know. Some shareholders have indicated an interest, and we have also started a waiting list for additional shareholders. This year’s shareholders do have priority. We would appreciate notice of your interest by January 1. Look for a year-end survey to come in your email box this month. Your input is greatly appreciated. Thank you to all who provide us feedback as to what you enjoy, and how you are using it. It does provide us with renewed energy and motivation. Lettuce Blend – Blend includes Prizehead, Red Oak Leaf, spinach and Simpson Elite. Carrots – This crop was a challenge this year. The heavy rains and then the dry weather caused this crop to under perform. We were excited to get some nice carrots out of our pallet gardens thought. We thought you would enjoy a small taste. Butternut Squash – One of our families favorite vegetables. Check last week’s post for how I prepare this vegetable or on Martha Stewart for more ideas. Winter Carnival Squash– This is a new vegetable for us to try as well. But since the boys love squash, I can’t wait to try it. Here are some links for cooking it and some recipes from Taste of Home. Potatoes – This week we have Norland – great for mashed or boiled potatoes, Yukon Golds – great for baking or cooked and Kennebec – great for baking and blue potatoes – try them mashed or as french fries – very colorful and fun. We have A LOT of tomatoes. A portion of the proceeds from the sale of the tomatoes will be given to Gillette Children’s Hospital and American Red Cross. Free will donations accepted. Those not purchased will be donated to the food shelf. 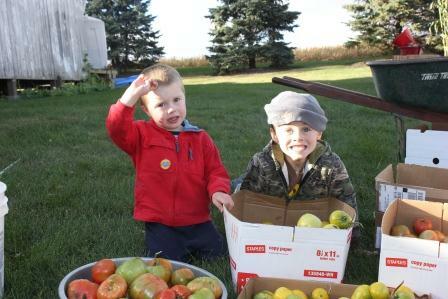 Tomatoes – Tomatoes in your boxes this week to include Big Boys, Roma, Yellow Girl and cherry tomatoes. Ideas for tomatoes in case you want to purchase an additional for freezing or for canning – fun ideas With the cooler weather, some of you had asked for tomato soup recipes. Herbs – Parsley, orange thyme, lemon thyme, cilantro and peppermint. Remember you can dry them or you can freeze. Both boys were troopers. This pumpkin was heavier than it looked! Our Big Max pumpkins grew but not overly large this year. We need some fertilizer in that area of the garden! This white one is a beauty! Pumpkin – The shareholder’s kids each received a pumpkin for carving or painting for this fall season. Note: if you were looking for something specific let us know, and we can let you know if we have it. Some of these crops were sporadic and/or quantities limited. As we were harvesting popcorn and discussing how to use it, Steve said that this corn sheller was bought by his Grandpa Gifford for that very process – shelling popcorn. 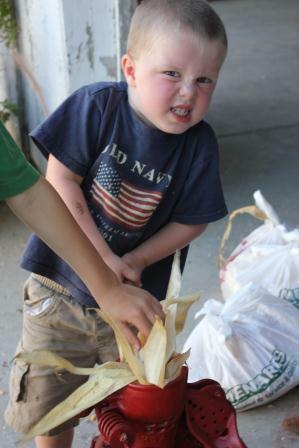 He remembers shelling popcorn when he was a kid…and so the tradition continues. We will pop some of the popcorn by leaving it on the ears, and we will shell some to store in the freezer to use throughout the winter. Strawberry Popcorn – A surprise in your box this week is Strawberry Popcorn. You can either use it for decoration or to eat! We popped some this weekend for our movie night, and the boys really enjoyed it. We followed these directions. Super easy, and we microwaved it for about as long as we would a bag of microwave popcorn. So how tall was the broom corn. Taller than Steve, Keith and Sam combined! Some was over 14 feet tall! Fresh Flowers – Broom corn and gourds. 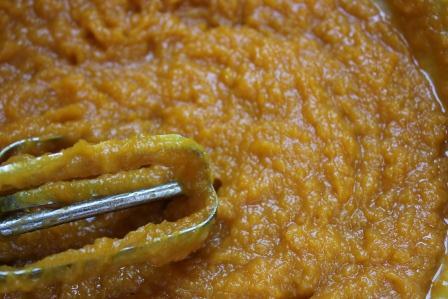 In a large mixing bowl beat eggs, sugar, pumpkin/squash and applesauce until smooth. 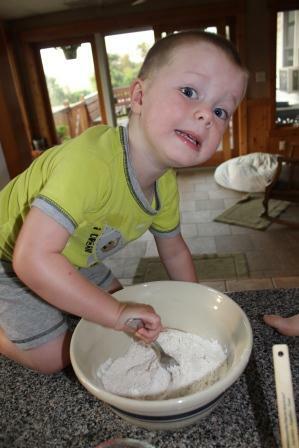 Combine flour, baking soda, baking powder and cinnamon. 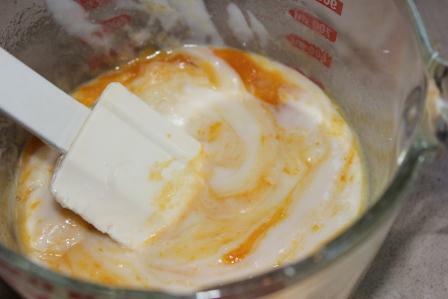 Add to pumpkin mixture and mix well. Fold in miniature chocolate chips. Fill greased or lined muffin cups 3/4 cups full. Garnish with a few miniature chocolate chips. Bake at 400 degrees Fahrenheit for 16-20 minutes until they test done. (When you press your finger on the top of the muffin and it pops back up.) Cool in pan 10 minutes before removing to cool on wire rack. We sincerely thank all of you for trusting us and taking the leap of faith on our inaugural year. We greatly appreciate each and every one of you. Your feedback and input have been greatly appreciated. We enjoyed the privilege of working with all of you! 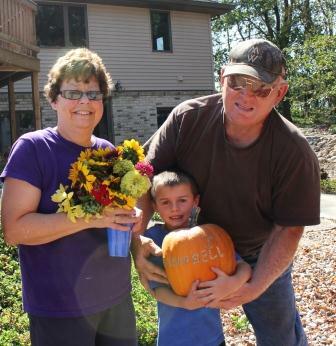 We wanted to thank all of our shareholders by giving you all a personalized pumpkin with your family name on it. Sorry Kraby’s that yours didn’t make it, but the chickens loved it! We are glad we had a nice pumpkin to give you in its place. 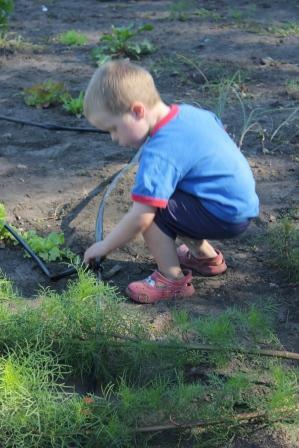 We appreciate all of you for trusting us to provide your family with vegetables this growing season! 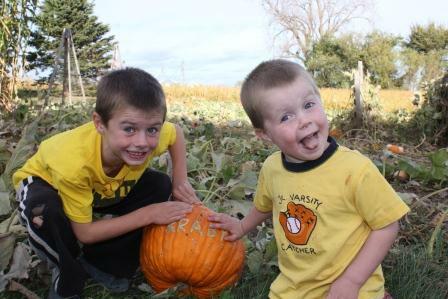 Fall is a time of alot of family fun, especially when you live ona farm, and you have the rush, stress and excitement of harvest. The rush of seeing what you have grown and the rush to race the clock; the stress of getting it done before Mother Nature gives you the signal that you are done, ready or not; and the excitement of what treasurers are unveiled during the process. While our harvest may be different then some of our family members who grow corn and soybeans. The other three components are still there rush, stress and excitement. During this time of the year, everyone sees a lot of farm equipment on the road. With this in mind, I ask you to remember that while we may always think that our hurry is always more important then the other person’s destination. Slow Down! To many people lose their lives because either they don’t see the farm equipment’s slow moving sign, driver distraction, or they feel their destination is more important. No one’s destination or hurry is more important then someone’s life. Slow Down, Be Alert and Stay Alive! After all, the farmers are simply trying to raise our food for our families. In early August, Steve took one of his Grandpa’s handmade wood carving tool and headed to the garden. 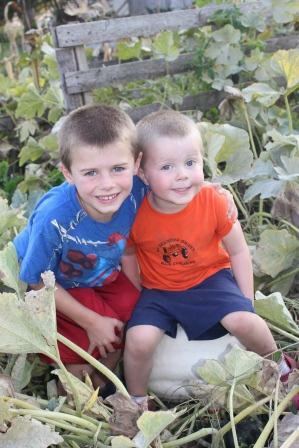 Our kids then helped select a pumpkin for each of our CSA families. 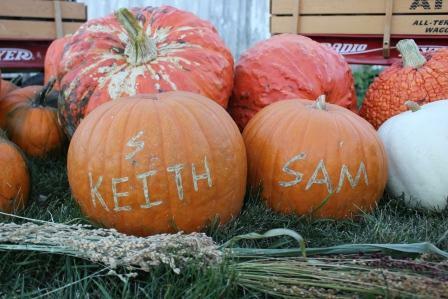 Steve then carefully etched the last names into a pumpkin. We hope you enjoy this decoration this fall. It is one of our ways of saying Thank You for business! While the CSA season’s final delivery is next week, we have alot to harvest this weekend including: potatoes, gourds, pumpkins, squash, broom corn, popcorn and tomatoes. Sam checking out this round of green beans and dragon tongue beans. This was a late planting experiment to see how fast the plants would develop, and if they would produce before a frost. Note: If you are interested in being included in next year’s CSA. Please let us know. We have had some shareholders indicate an interest, and we have also started a waiting list for additional shareholders. This year’s shareholders do have priority. We would appreciate notice of your interest by January 1. Cucumbers – Just a few remaining. Peppers – Green, orange and banana peppers. A few ideas of what you can do with the peppers. 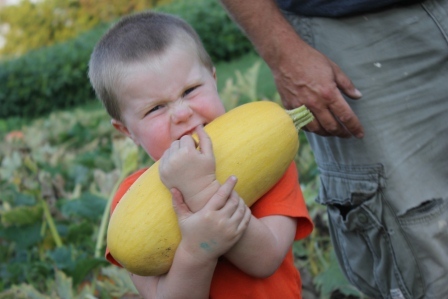 Summer Squash – Zucchini – Picked what was out there this week. Because the weather had indicated a strong possibility of frost on Saturday night which would have killed these plants. Potatoes – This week we have Norland – great for mashed or boiled potatoes, Yukon Golds – great for baking or cooked and Kennebec – great for baking. Learn how to store these vegetables. Herbs – Parsley, thyme, cilantro and lemon thyme. Remember you can dry them or you can freeze. Keith with giving his Grandma Norma and Grandpa Swede their box of produce. 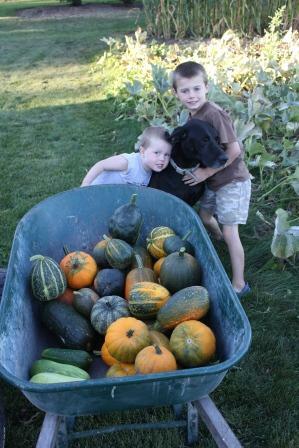 Pumpkin – We will be harvesting pumpkins and gourds this weekend and will have a mixture for you next week. Fresh Flowers – Dried hydrangea or sedum arrangements or sunflower arrangement. 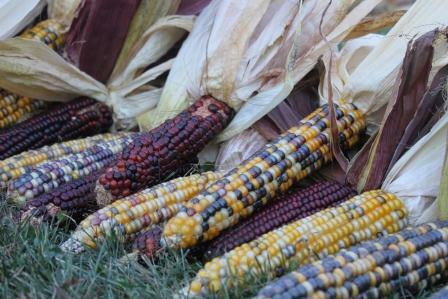 Next week, think ahead to what you will want to do with the broom corn and gourds that will be arriving. 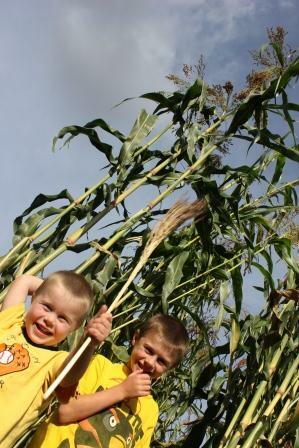 Sam and Keith showing us how tall the broom corn is. If I have any extra leftover. I freeze the dough in muffin tins. Once frozen, I will place in a small container or a bag. Meals in a minute another night. Preheat large nonstick skillet on medium-high heat. In a bowl, stir together all dry ingredients. 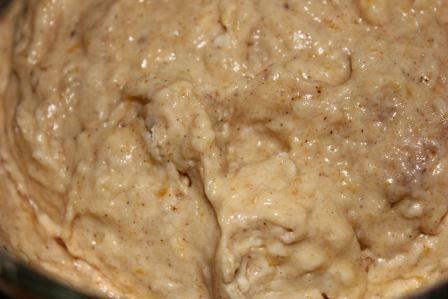 In a large bowl, beat egg then add yogurt, pumpkin/squash, and 2 Tablespoons melted butter. Beat well. 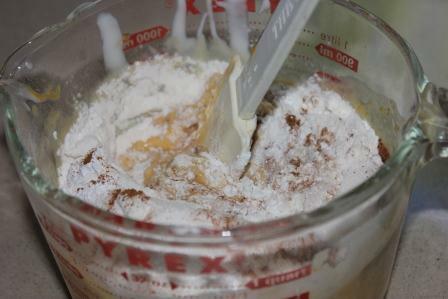 Stir in dry ingredients and beat just until combined. Grease skillet lightly with butter. Pour about 1/4 cup batter per pancake, flip with spatula when tops bubble and edges are slightly dry. Cook until other side is golden brown, 2 minutes per side. Just about all recipes that call for canned pumpkin I substitute my butternut squash that I have cooked and prepared as I demonstrated in last week’s blog. When you begin preparing this recipe, preheat large non-stick skillet on medium-high heat. 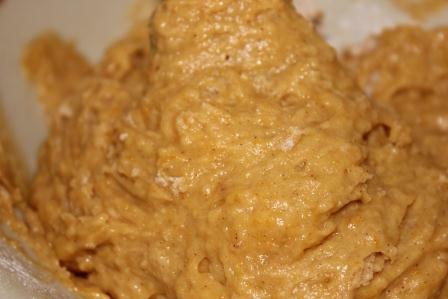 Mix together 1 egg, 1 cup plain low-fat yogurt (I use any flavor of yogurt I have in the refrigerator), 1/4 cup canned pumpkin or squash puree, 2 Tablespoons melted butter. 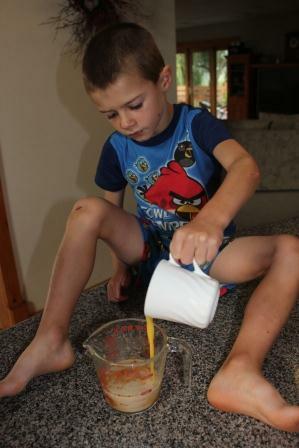 Keith is a great helper in mixing up the pancakes. In fact, this is one of the kids’ favorite recipes. Stir in dry ingredients: 1 cup flour, 3 Tablespoons of sugar, 1 teaspoon baking powder, 1/2 teaspoon baking soda, 1/4 teaspoon salt, 3/4 teaspoon cinnamon and 1/4 teaspoon nutmeg. Stir all ingredients together until combined. Grease skillet lightly with butter. Pour 1/4 cup batter per pancake; add blueberries if desired (I make a face with the blueberries in the pancake): flip with spatula when tops bubble and edges are slightly dry. Cook until other side is golden brown. About 2 minutes per side. I serve the pancakes with scrambled eggs garnished with cheese and parsley. Serve with orange juice and you have your food groups. 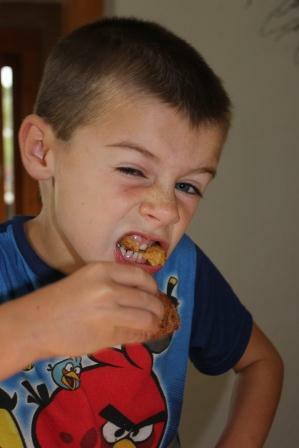 Hopefully your joy in serving this is like mine – no complaints from the kids…only smiles and full stomachs! With 56 tomato plants, we have more than enough. Please let us know, if you or anyone you know is interested in buying tomatoes for canning or freezing. We have donated extra tomatoes to the local food shelf and shared with the students and staff at the Northfield Montessori. 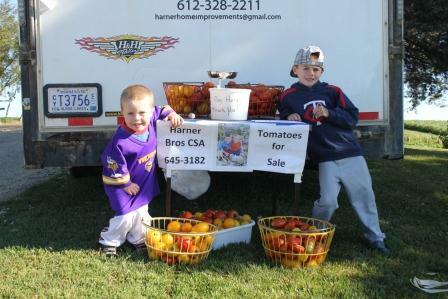 Can you believe that there are only two more weeks of the CSA? This will bring us to week 18. Boy has that flown by! I look out into the garden and am in awe of how fortunate we have been, and the variety of produce that grew during this crazy growing season.With that said, your boxes will be full the next few weeks, as long as we don’t get a hard freeze. As you may have noticed this week, we did include a few extra vegetables for your family to enjoy. If you are saving them for a later date, you may appreciate looking at Farm Flavor tips on preserving and storing extra garden produce. Believe it or not we still are irrigating so that we may have one last boost of salad crops. Above Sam is checking to make sure that their handiwork is working. Cucumbers – We hope you are enjoying this yummy vegetable. We are harvesting fewer and fewer each week. Peppers – Green, orange and banana peppers. I like to cut them up to 1/4 inch pieces and freeze them for soups and other recipes this fall and winter. Vermicelli “Spaghetti” Squash – I hope you were able to try this vegetable. We were really pleasantly surprised. Still trying to figure out how to prepare it? Here is another link to assist you. Onions – In your boxes this week were yellow onions. We harvested and dried them and will continue to share with you throughout the remaining weeks. 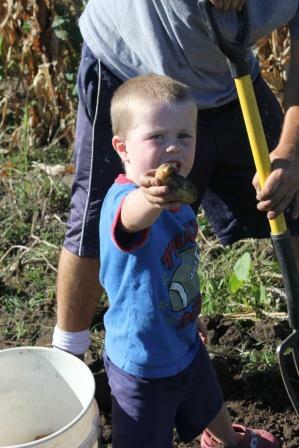 Digging for potatoes is a lot like digging for gold – just simply exciting! Potatoes – This week we have Norland – great for mashed or boiled potatoes, Yukon Golds – great for baking or cooked and Kennebec – great for baking. With Patriot Day this week, I thought this red, white and blue potato salad would be fun. This weekend I made homemade fries from these potatoes. The boys really loved the blue potatoes as fries. So much, that Sam asked if we could bring them into school to share with his friends. Herbs – Parsley, oregano, cilantro, and lemon thyme. Remember you can dry them or you can freeze. Fresh Flowers – Ornamental Corn for you to put in arrangements of five. I generally tie them together with a piece of twine and hang on either side of the garage and shop. 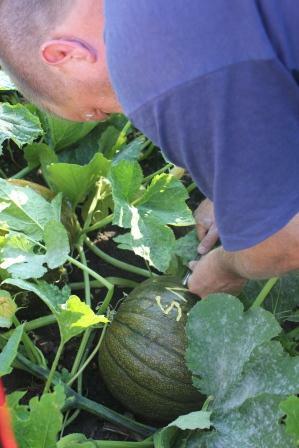 Starting to pick gourds and pumpkins. 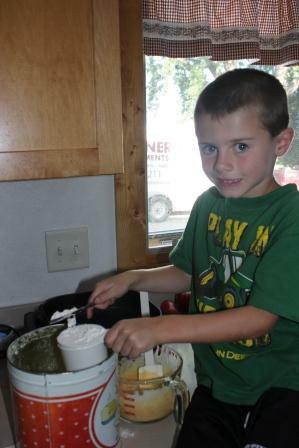 My family loves this recipe, and the boys eat it like crazy. I also use the prepared squash in place of pumpkin in many recipes. Butternut squash will be in your boxes next week. *Cut squash in 1/2 add enough water to cover pan (about 1/2 inch up on the side of the pan). Bake at 375 degrees for about 1 hour. To save the extra, place in a cupcake tin and freeze. Place frozen portions in storage containers to be stored in your freezer. Enjoy! With September upon us, the leaves are dying on the vines and some treasures are being unveiled. 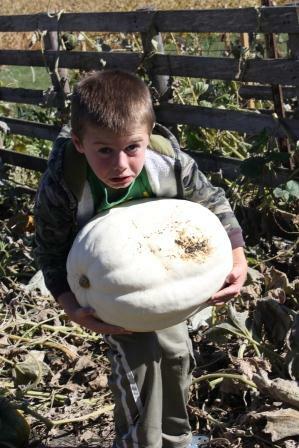 We look forward to harvesting squash, gourds and pumpkins for all of you. September upon us, and the excitement and busy work of the last of the harvest is in full gear. This weekend we start the process of harvesting crops that are ready to go. We have 3 weeks left to get a lot of delicious and fun stuff in your hands. The final CSA box of the year will be the last week of September which will bring us to 18 weeks. Enjoy the bounty! Cucumbers – We hope you are enjoying this yummy vegetable which I think only has a week left. Sam helping to harvest the spaghetti squash. Vermicelli “Spaghetti” Squash – We will have another one for you next week. We ate it tonight like spaghetti, and everyone liked it! I then froze the extra in family sized portions and will get two more meals out of the one squash. I followed these directions to use the squash. Enjoy! Potatoes – This week we have Norland – great for mashed or boiled potatoes, Yukon Golds – great for baking or cooked and Kennebec – great for baking. Believe it or not, I baked some of my frozen potato buns on the grill this weekend, and it worked! I placed the frozen dough on aluminum sprayed aluminum foil on the grill for about a 1/2 hour. So I put them on when I put the meat and the sweet corn and in a 1/2 hour all of it was done! We have plenty of tomatoes for sale $28 for 50# or $14 for 25#. Let us know if you are interested or please pass our information on to those that are interested in some for canning. The varieties make for delicious sauce, juice, salsa and soup. See the tomato section below for ideas of what to do with extra tomatoes. 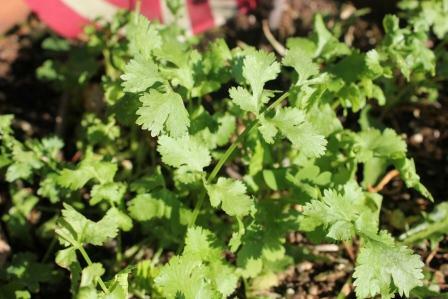 Cilantro – a favorite for homemade salsa. 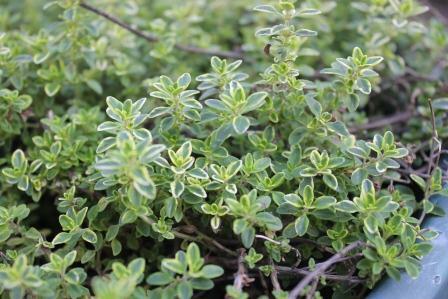 Lemon Thyme – great for placing on top of meats while cooking on the grill. Fresh Flowers – Zinnias or sunflowers this week. Place a few hosta leaves in with them when placing in the vase. Also, remember to add about a teaspoon of bleach to help the flowers last longer. Combine dry ingredients 1 1/2 cups flour, 1/2 cup sugar, 2 teaspoons baking powder, 1/2 teaspoon salt, 1/4 teaspoon cinnamon, 1/4 teaspoon ginger, 1/4 teaspoon nutmeg. Mix with a fork. 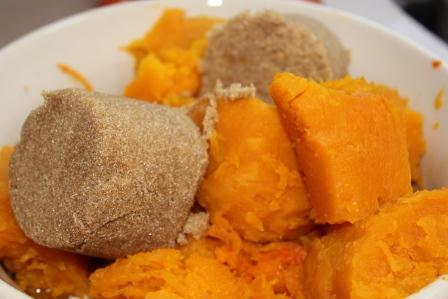 Combine: 1/2 cup canned pumpkin or squash (I freeze my squash in cupcake tins after I have cooked it and mixed it with butter and brown sugar. This is what I use. 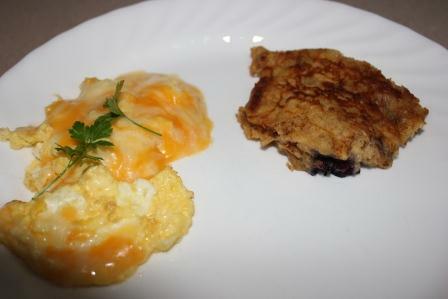 ), 1/4 cup milk, 2 Tablespoon applesauce,1 teaspoon vanilla and 1 egg. 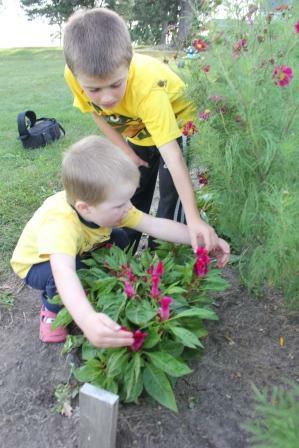 Kids love to try what they help to make! 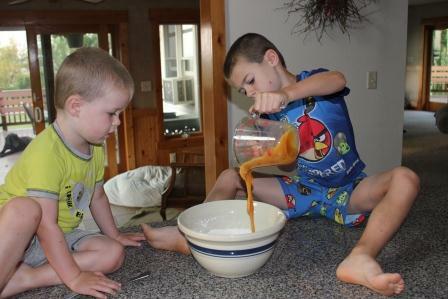 Sam and Keith are combining the dry and the wet ingredients. This is what the dough looks like. Drop into hot oil by teaspoonfuls. 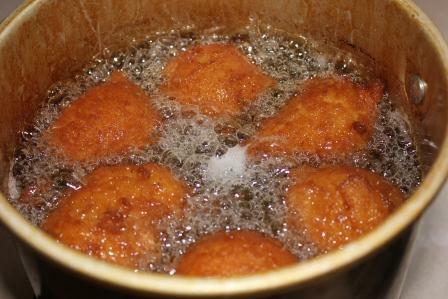 Cook in hot oil – 375 degrees – for about 1 minute on each side or until golden brown on both sides. 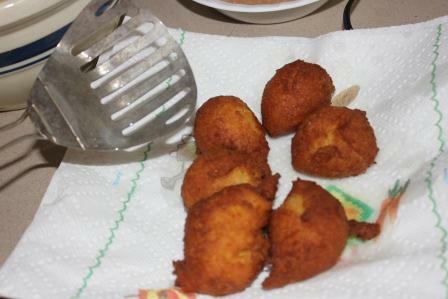 Take out of the oil and place on a couple of paper towels on a plate to drain the oil off the donut holes. 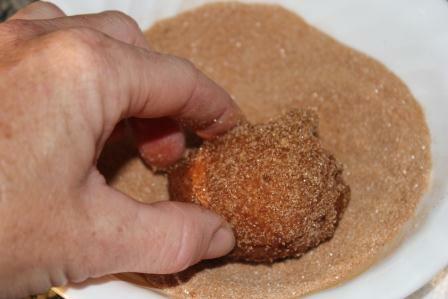 Roll in a combination of 1/2 cup sugar and 1 teaspoon cinnamon. Heat 3-4 inches of oil to 375 degrees F in a deep fryer or heavy saucepan. Combine dry ingredients and blend well. 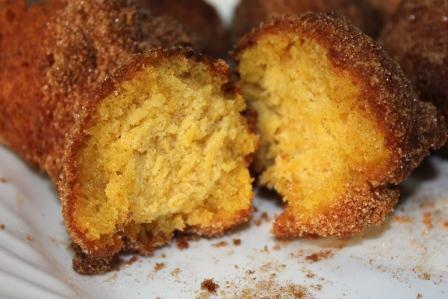 Combine pumpkin, milk, oil, vanilla and egg; stir into dry ingredients just until moistened. Drop by teaspoonfuls into hot oil, a couple at a time. Fry for 1-1 1/2 minutes on each side or until golden brown (They pretty much turn themselves.) Drain on paper towel. Roll warm doughnuts in sugar/cinnamon and enjoy! This recipe was a hit with the entire family.